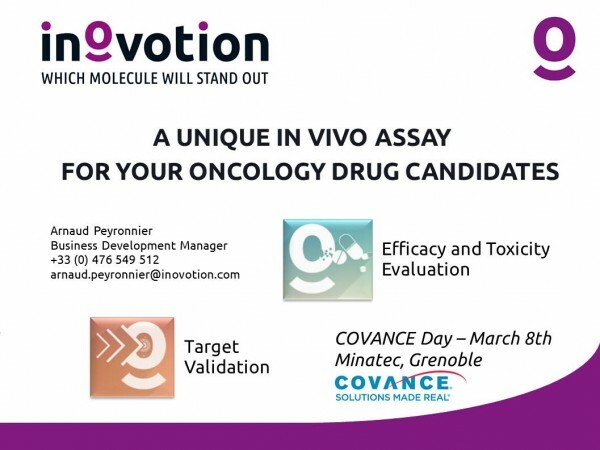 INOVOTION was one of the startups selected to meet Covance, a world-leading drug discovery Contract Research Organisation. This event was organised by LyonBiopôle, Minalogic and Covance, at Minatec Grenoble March 8th, to bring SMEs and large companies closer together. During this event, several technology companies based in the Rhône-Alpes area were presented. Our Business Development Manager gave a short presentation of our company. Via this meeting, our commercial team was able to discuss about the benefits of a potential synergy with Covance about drug discovery services. Thank you very much LyonBiopôle and Covance for organising this event! For more information about the presentation feel free to contact us!